Detective Eric Watkins of the Delaware Capitol Police will be the first to tell you that his Delaware Tech degree is the foundation of his successful 23-year career in law enforcement. 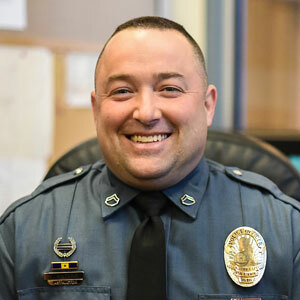 While earning his criminal justice degree from the Owens Campus in the early ‘90s, Watkins interned as a seasonal police officer in Bethany Beach. He credits his success in the program to caring faculty who supported and guided a group of ten students who would eventually all become police officers. “They kept us straight and helped us succeed,” says Watkins who upon graduation was hired by the South Bethany Police Department (SBPD) and attended the Delaware State Police Academy. In 2012, after 18 years with the SBPD, Watkins left to join the Delaware Capitol Police in Delaware’s Division of Homeland Security which is assigned to protect specific state facilities. He works as a detective in the special unit which investigates crimes against legislators and the judiciary. He also serves on the agency's firearms unit and honor guard and was awarded the 2015 Officer of the Year as a result of his work in the firearms unit. Watkins’s Delaware Tech degree was the first of his many educational achievements which include instructor-level certifications in firearms, weaponless defense, pepper spray, Asp baton, verbal judo, radar, field training, certified evidence technician and armorer. For anyone currently considering a law enforcement career, Watkins touts the College’s new Law Enforcement Option (LEO) program. LEO is offered in partnership with the Delaware State Police (DSP) Training Academy and provides the education and training to be a competitive applicant for the DSP or a municipal police agency. “It’s a great program that shortens the time it has traditionally taken to become a police officer in Delaware,” he says.